Sunday morning began with a short drive from our hotel to the Jardin d'Acclimatation. There were numerous signs along the route advertising a car-free day in Paris that we missed by a week, a very lucky escape given our schedule and routing. While I respect the fact that there are environmental benefits to this sort of exercise, I take the view that a blanket ban on vehicles borders on the autocratic in a world where people will occasionally have to travel at short notice for unforeseen emergencies. Public transport in Paris is far better than it is in my home city of Dublin, but it is a long way from being exhaustive, especially for those needing to get to the outskirts of the city. Speed Rockets (#2503) features elaborately themed four-person vehicles that look like a classic car body fitted with jet engines. These begin their journey with a fast chain lift and an unusually profiled drop that could almost be considered a double-down; a slight bump on the descent delivers a gentle pop of airtime for those seated in the back of a car. The course avoids wild mouse curves, focusing instead on an alternating series of twisted climbs and descents that are handled effortlessly. A mist-filled tunnel fogs up glasses and obscures the start of a second tyre drive lift hill, which drops into more of the same. The experience concludes with a tight left hand helix into the final brake. 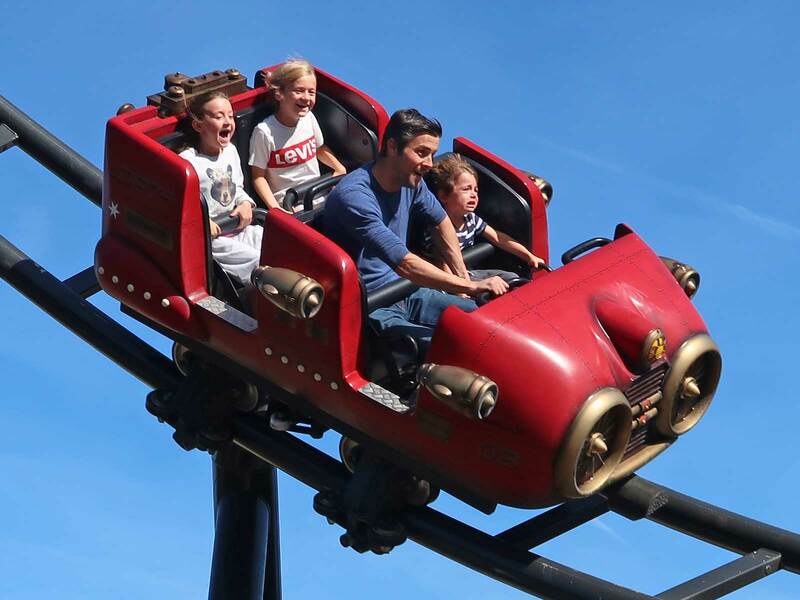 The ride is the perfect addition to the park, being a few points higher on the intensity scale than the existing attractions while still gentle enough for the whole family to enjoy. Throughput is kept high by the simple expedient of lots of cars at once; though the queue was virtually full by the time we went back for our second lap we were still on board in less than twenty minutes. It'll be interesting to see if the demand levels out after a season or two; if it doesn't, then it bodes very well for the addition of more intense roller coasters in the future. The biggest change to the park this year is a comprehensive new steampunk theming package. The various midways now have vents that blow out clouds of cooling vapour every few minutes, and all of the existing attactions have been renamed and repainted to fit in with the new look. The former Tacot Express is now the dark brown coloured Machine à Vapeur (Steam Engine). The only thing I remembered about this ride from my previous experience of it fourteen years before was that it was good; I'd completely forgotten a powerful drop into a tunnel, several feet below the station, that was the absolute highlight of the layout. We made our way over to the Dragon Chinois, but sadly it was out of service today. The sign at the entrance used the word "momentarily" and suggested that it would "reopen very shortly", but it looked to us like a significant overhaul was in progress, as the pool under the track had been drained and one of the motor banks had been disconnected. As such our third and final coaster for the morning ended up being the former Papillons d'Alice, now known as Souris Mecaniques. The ride itself was unchanged, though the car bodies had been replaced with new ones featuring oversized mechanical wind-up screws. When I planned our weekend in Paris several months ago I selected a late afternoon flight back to Dublin on the grounds that I was coming in from Singapore and wanted to avoid getting home too late. The best option departed Orly Airport, a few miles from Babyland-Amiland, which just happened to be getting two new coasters as part of a three ride package for 2018. As the season progressed it became evident that construction work was behind schedule, but I held out some hope that they might be ready by mid-September. Sadly this proved optimistic on my part. 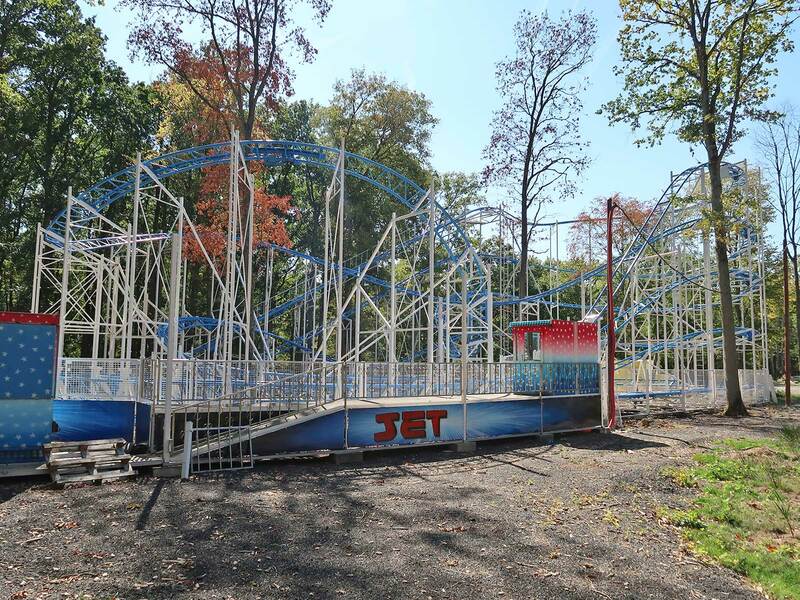 In late August a fellow enthusiast reported that Jet was HNFT, and though Buche Dansante looked to be finished the lack of wheel marks on the rails indicated that testing had yet to begin. Given that I spent some time researching whether there were any alternatives to the park that we could reach without missing our flight. The one potential option was the alpine coaster at Base Régionale de Loisirs d'Étampes, and though I wasn't able to find opening hours online I thought it was worth a roll of the dice. Unfortunately that plan fell by the wayside as we hit unexpectedly heavy traffic on the way out of Paris; by the time we'd cleared the Périphérique we had just two hours of slack time, and the only realistic option was to stick with the original itinerary. The owners of Babyland-Amiland have taken an unusual approach to landscaping, insofar as they really haven't bothered with it; instead, the various attractions have been installed into a tree-lined grove with an unsealed road taking the place of a main midway. 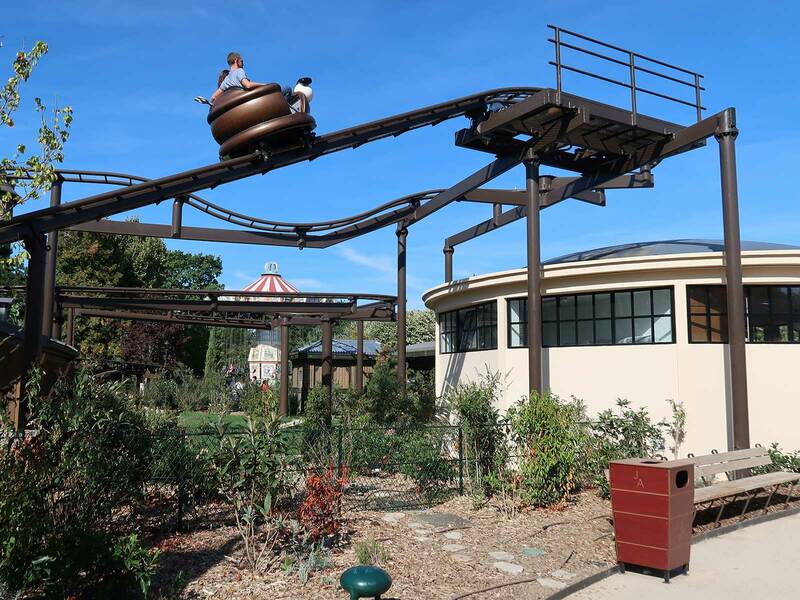 Most of the machines can be found in an open area at the far end, and as the park name suggests only a subset of them are suitable for older visitors. The three coasters are all on the right hand side of the park, and as expected the only one open today was Grosse Pomme (#2504), an undistinguished Big Apple. We were given three laps of the course, as ever two more than we needed. After taking our photographs we decided to try Magic Farm, a tracked tractor ride (see what I did there?) playing the SBF-standard jingle from Under the Sea. The ride had the longest queue in the park, though this was primarily due to low capacity. The layout passed by some token theming, including cartoon cows and four-foot high plastic roses, that felt like an afterthought when compared against similar rides at parks like Energylandia. By the time we disembarked we had just fifteen minutes left before our planned departure time, which we put to good use on the Grande Roue.